Since 1977 The Sod Farm has served as a family owned and operated sod & garden center in New Port Richey, FL. Our family has been involved in the agriculture industry for many generations, dating all the way back to the old country in Hungary. We started working with the production of St. Augustine and Bahia Sod in West Pasco in 1965 and we’ve continued to grow ever since. Jumbo Grass Plug NOW AVAILABLE! 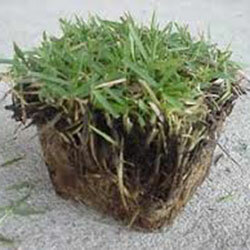 Give our Jumbo Grass plugs an inch and they will make a YARD!